Who loves meal planning? Nope, me either. Meal planning can get so time-consuming and sometimes feel pointless in the everyday busy of being a mom. Yet, if you, like me, want to feed your kids healthy dinners and not break the bank, you are going to have to plan meals. Today, I'm showing you how to meal plan in a way that is simple and quick. It is perfect for busy moms. Last summer, I decided to give a new way to meal plan a try. I was looking for something that would end the weekly hassle of figuring out what the heck we were going to eat for the next week. I was also looking for a way to make it easier, faster and dare I say lighten my load as a mom a little bit. Yep, I was asking for A LOT! Yet, I think I found a way to meal plan that has made things faster and easier for me and because I got my kids involved, I have lightened my load. So what is this golden nugget? I have a video below showing you all of this as well. Decide on nightly (and daily if doing lunches as well) themes your family will enjoy eating. This is nothing new. I'm certain you've heard of Meatless Monday or Taco Tuesday. Yet, I had never tried it. I thought it would get too boring. Have you tried it? Long term? You don't have to go with the standard themes. Pick things you know your family will eat and things you think you will be able to find a good variety of recipes surrounding that theme. You may want vegetarian, taco, breakfast, pasta, pizza, chicken, soup, salad, pork, beef, Italian, Mexican, or any other variety of themes. For my family for our dinners, we have Meatless Monday, Taco Tuesday, Breakfast Wednesday, Wild Card Thursday and Pizza Friday. 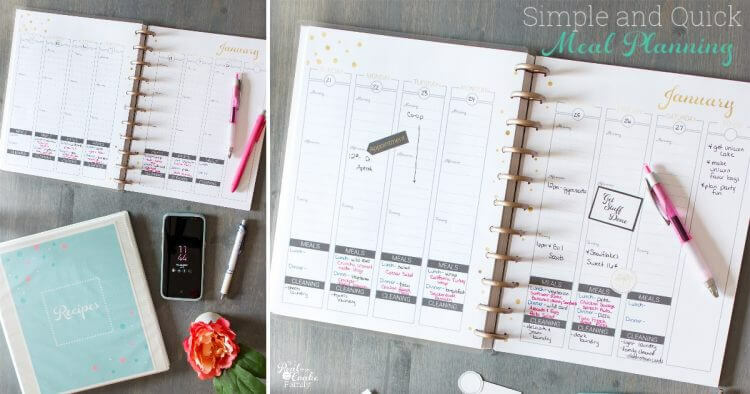 If you have 5 themes, this is super simple, Just assign a theme to each day of the week. Write that in your planner. 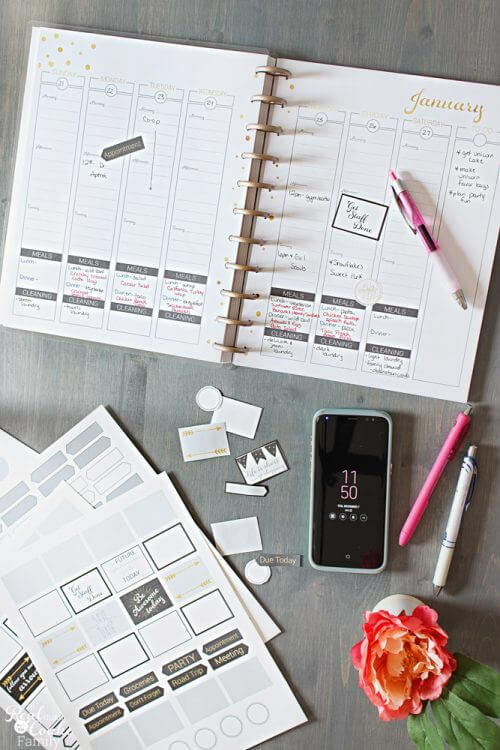 The planner above is the Real Organized printable planner available in my shop. It has a built in place for meal planning and a few other things I haven't found in other planners. 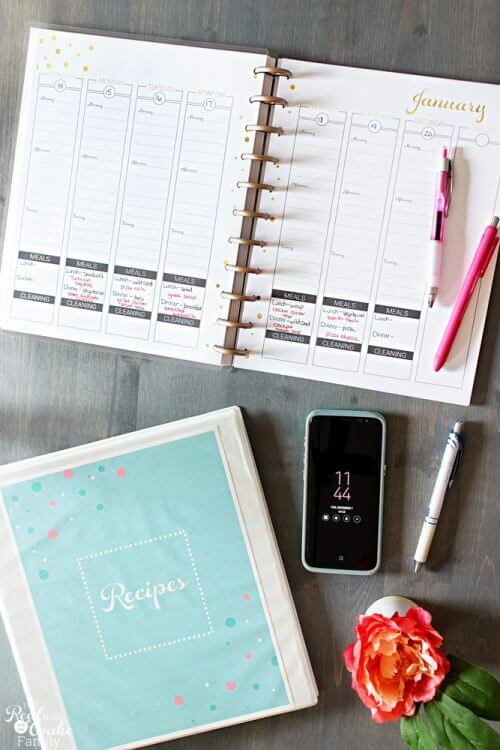 It just keeps it all in one place, which when you are a busy mom….having everything in one place is a sanity saver! In the case of rotations, assign a rotation. That way once a theme has made it through the rotation, you know what to add next week. For example, the week of lunches pictured above was sandwich, wild card, salad, wrap, and vegetarian. The next week for us would be wild card, salad, wrap, vegetarian and pizza. I then continue rotating them in this fashion over the weeks to give us variety. This is the best part of planning ahead. You can plan WHO will cook…and let me give you a hint…it isn't all you! At our house, my girls each cook one lunch and one dinner each week and my husband cooks lunch and dinner on Sunday. Depending on the age of your kids, there is no reason they can't help with cooking. Your partner or spouse is also hopefully taking a few meals as well. Everyone eats. Therefore everyone should be helping with the cooking and clean up. Your house isn't a one-woman show after all. The last step is to take your recipes and pick those that match your themes and assign them to a night or day for each theme. If your recipes aren't organized, this is going to take a little longer. 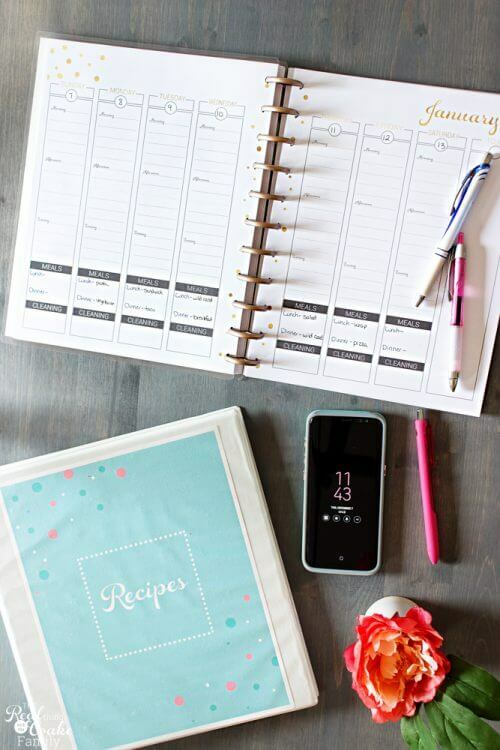 You can get your recipes organized with these steps and this printable recipe organization set. If you want to take things a step further and make them even easier. I highly recommend using Plan to Eat(affiliate link). I will have a post in the future about how I'm using it with this system to make my meal planning even faster and more organized. The extra bonus with Plan to Eat…it makes a printable grocery list!!! So not only is it faster to plan meals, but I don't have to even spend much time making my grocery list either. ?Love that! You can also combine Plan to Eat with Once a Month Meals if you want to batch cook and cook a bunch of meals at once. Saving your weekly prep and cook time by batching cooking together and then Plan to Eat can track what you have in the freezer and help you plan those meals so they get used. I mean! Match made in quick and easy heaven! Step 5: Enjoy extra sanity, money and time! 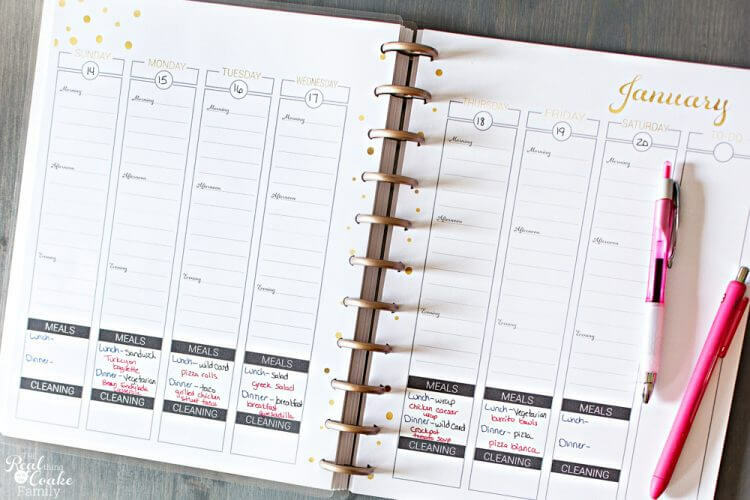 I know that may sound dramatic, but by assigning themes to days of the week and making expectations of the whole family clear, you are going to save yourself time. You are also saving yourself sanity by not being a one-woman show. Your family can and should help in whatever capacity they can. Finally, you are going to love the savings! If you have been going for daily grocery trips and/or just going for the easy eating out, you are going to love how much money this saves you. As I said at the beginning, we have been using this system for about 9-10 months now. I started it skeptically. For me, it wasn't about the meal planning because I already did that, it was about making it faster and easier. This has accomplished that. I was worried we would get totally bored with our themes, but thus far we have not. Now, when I'm on Pinterest and I see a recipe I want to try, I just add it to my queue in Plan to Eat and assign the cuisine to it for the theme (i.e. Taco or Breakfast). I promise I will explain this part in an upcoming post/video soon. The point now is that I seem to have a constant stream of new recipes to try and we are not bored with our meals or themes at all. In full disclosure, we did vary our themes a bit from summer to winter (i.e. soup versus salad, etc), but the planning has remained the same. So, what are you waiting for? 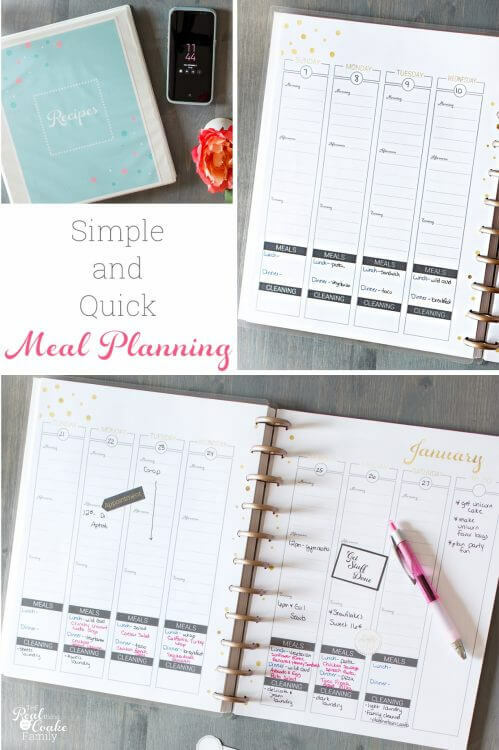 Now that you know how to meal plan, go grab your Real Organized Planner and if you need it your Recipe Organizer and get going. You are going to love it!